Quick overview Eric doesn't like to talk. 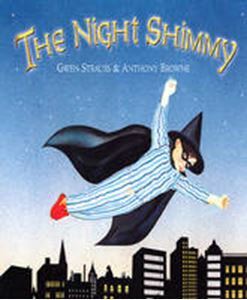 His secret friend, the Night Shimmy, says everything for him. Then Eric meets Marcia, who doesn't mind that Eric is quiet. And Eric discovers he doesn't need his imaginary friend after all. Eric doesn't like to talk. His secret friend, the Night Shimmy, says everything for him. Then he meets Marcia, who doesn't mind that he is quiet. As the two become friends, the Night Shimmy disappears. Angry and scared, Eric refuses to play with Marcia. But soon she needs his help and Eric discovers that he doesn't need his imaginary friend after all.